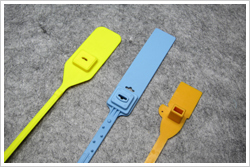 The plastic strap seals are designed with wide strap and contain a strong metal mechanism insert provide high pull strength. The GuardLock Seal is a high secure tamper evident pull tight seal. It is made of high strength nylon and has a strong metal lock mechanism used to secure big bags. The RobustStrap Seal is a heavy-duty, adjustable length plastic strap seal for use on a wide range of applications. It is available in polypropylene or high strength nylon and can be barcoded. The Dumbo Seal is a one-piece pull tight seal that offers a cost-effective solution for a various applications. It has a hole on the side ear, which could hang a tag fasten by plastic pin. The BigTag Crawler Seals is designed primarily for the courier & postal industry. The big tag is very visible, allowing easy identification and more information to be included. The CrawlerLock Seal is an adjustable pull up security seals for quick application and immediate. It is available with tear-off and label-holder in same model. The crawler shape strap enhances the seal's grip and it's security. The SackLock Seal is a sturdy, versatile pull-tight seal that is used in a variety of applications, from sealing postal and courier bags to securing industrial equipment after maintenance.